Here's another Atelier series artbook translated by Udon. The original Japanese edition ロロナ＆トトリ＆メルルのアトリエ プレミアムアートブック was published in 2011. The Japanese edition has pretty favorable reviews. Udon also did a great job with the English edition. The book's is a paperback with 256 thick pages. Binding seems good enough for a book this thick. 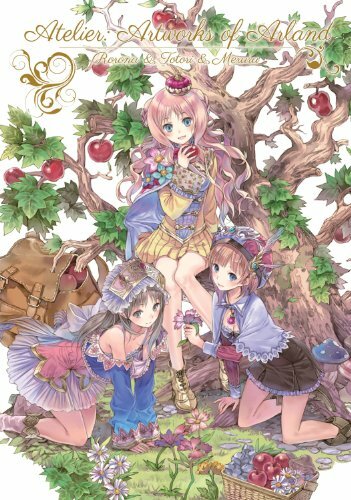 Those three are the 11th to 13 game titles with the Atelier series — already?! Mel Kishida is the character designer for these three games. The pages are fill with full page illustrations, character designs, storyboards of cut scenes, pin-ups and sketches. These are Japanese style characters with strong shoujo influence. There are lots of female characters with their fancy dresses and generous use of pastel colours. The illustrations are beautiful with details. The costume designs are rendered really nice. There's not much text except for the short notes beside sketches. If you like the games and art, this is the book to get. Thanks so much for the review and preview, Parka! Glad you enjoyed the book! This is a really nice book. This is a really nice book. Very vibrant and colorful. I hope there are more artbooks like this. Can I ask why I purchase the book from amazon? its says *Can't ship to selected destination*. Is it because i'm from malaysia? It should be able to ship to Malaysia, unless you're buying from a third party seller on Amazon.